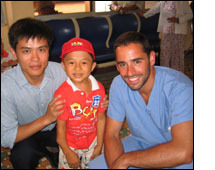 In May 2006 I traveled to Vietnam as part of The Vietnam Medical Project, a small group of doctors who help serve the indigent population at The Danang Orthopaedic Center, Danang, Vietnam. I spent two weeks with the organization evaluating and treating patients, some of whom journeyed up to eight hours by motor vehicle to arrive at the center. 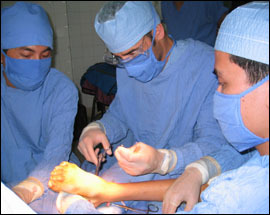 I was finishing the second year of my Podiatric Surgical Residency in Morristown, New Jersey when the opportunity arose to go on this medical mission. I thought I knew what to expect in terms of poverty and physical deformities, as I have attended many conferences and seminars where missions of this nature were the topic of discussion. Interesting, with my arrival in Vietnam came a sense of ease. It certainly was not the result of a slow pace, for I had landed in Ho Chi Min City, South Vietnam, and the streets are as crowded, noisy and busy as New York City. If a person isn't truly careful they can become a serious victim of a motor vehicle accident - cars were fewer but mopeds zip and zoom everywhere, in and out of traffic, paying no heed to traffic regulations. Sometimes a family of five pulled up on a single moped. After landing in Ho Chi Min City we flew on to Danang. Because it had already taken almost 20 hours to get to Ho Chi Min City from New Jersey, the idea of flying was not a welcome one. However, after arriving in Danang I would have traveled another 20 hours to get there. Danang, located in central Vietnam, is a metropolis whose city and suburbs feel more like the old west. It's a semi arid climate with a waterfront. It's absolutely beautiful. While in Danang I found myself wanting to work. Wanting to skip the after work dinners or social events. I took delight in discussions and the exchange of ideas, treatment plans and modalities, surgical procedures and methods. The local physicians/surgeons were remarkable - they certainly weren't getting rich by working in this setting but they were dedicated, resourceful and insightful. But more than that, the patients were simply amazing. They had few possessions and little money but were rich in spirit and pride. Their physical impairments were awful yet they were thankful for what they had and always were smiling. Their joy was contagious.